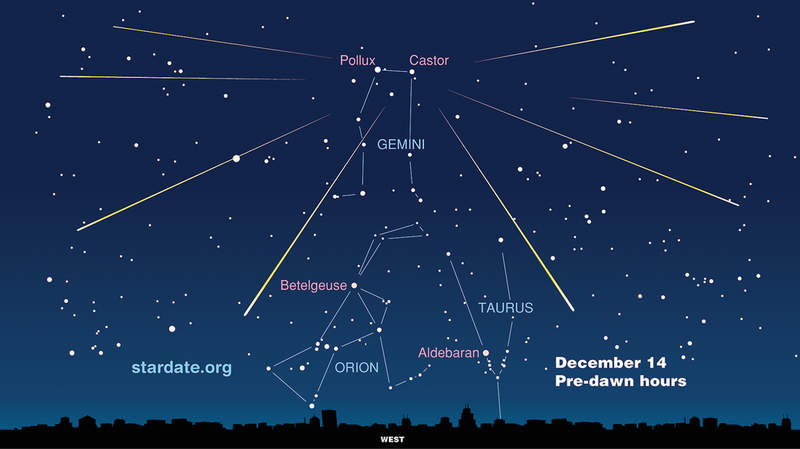 Over the coming week the 2010 Geminid meteor shower gets underway, building up to a peak which is expected on the morning of 14 December. I thought now would be an ideal time to repost a few excerpts from the blog post I wrote about the shower last year. “Meteors are produced when tiny pieces of space dust enter our atmosphere at enormous speeds. As they do the air ahead of them is compressed violently causing it to heat up. This tremendous heat in turn makes the meteor glow as it streaks across the sky. It’s amazing to think that the average meteor is created by a piece of celestial detritus no bigger than a grain of sand. If you go out over the next few nights and see any meteors you’ll know you’ve spotted a Geminid if it appears to come from a point in the constellation of Gemini. This point is known as the ‘radiant’. The constellation that the radiant is located in gives the meteor shower its name; so the Geminids come from Gemini, the Orionids come from Orion etc. In terms of where to look, my advice would simply be to look up. Gemini is high in the sky over the next few nights at around 1:30am, and with the Moon out of the way later on in the evening, we’ve got some good observing conditions for this year’s shower. Wrap up warm and sit back in a sun-lounger if you can, as this should stop your neck from getting tired and give you a better, more comfortable, view of the sky. Clear skies and good luck meteor watching! Back in the 1980s I was working night shift at a ceramic tile plant here in Coleman, Coleman County,TX. After my partner and I had finished unloading a tile car from the kiln, we went outside to take a break. My partner was lying on the hood of his car looking to the North. In a moment he said,”What the hell is that?” I turned to look above the building and there was a large meteor (or fireball) falling and it looked like it was coming right at us. It was bigger than the moon. Then all of a sudden it broke up and fiery pieces shot out in all directions. We then heard the sonic boom off of this thing and it shook the building. It left a smoke ring in the sky that lasted at least 10 minutes.